Bob Farrell, Merrill Lynch's now retired dean of Market Strategy, used to say "News doesn't drive the markets, markets drive the news." That's worth keeping in mind in light of the recent slew of bad news: Bleak forecasts from Cisco (CSCO) and General Motors (GM), slumping sales at retailers, state and municipal budget shortfalls. Then, there is the mother of all economic indicators, today's Non-Farm Payroll report. Bloomberg notes that BLS "will probably report that the jobless rate climbed to a five-year high of 6.3 percent in October" and that "Payrolls shrank by 200,000 workers, the biggest decline since the start of the Iraq War in March 2003." The Employment Situation report is released at 8:30am today. 1) Any given report is irrelevant. However, the employment trend is very important. Are jobs being created or lost? Are recent changes accelerating? 5) Reporting monthly changes in a labor market of a 140 million people with any degree of precision in real time is a difficult, thankless task, highly subject to revision. Regardless, we should expect an acceleration in job losses for the next 6 months as the worst of the credit crisis shows up in the data. Unfortunately, the NFP we have seen so far only reflects the mild recession we have been in since January. As the economic contraction deepens, and prolongs, NFP is only going o get worse -- potentially, much worse. That's a given. The question for investors is how much of the weakness, and coincident earnings recession, has been fully priced into the markets. One of the things this election will be notable for is how well the Press used digital media and interactive internet to dissect the issues and polls. I've gathered a slew of them and posted them in the Digital Media Tab. Here's a terrific example: Forget the polls for a moment, and consider instead what might be driving them. Interesting piece on how mortgage workers were comped during the heyday by John Quigley, titled Compensation and Incentives in the Mortgage Business. It goes a long way to explaining why so many people did such silly things during the boom: They were well paid to do so! the collapse. The incomes and fees generated are all transactions-based, that is, payments are made at the time the transaction is recorded. The originator of the loan, typically a mortgage broker, is paid at the time the contract is signed. Brokerage fees have varied between 0.5 and 3.0 percent. The mortgage lender earns a fee, between 0.5 and 2.5 percent, upon sale of the mortgage. The bond issuer is paid a fee, typically between 0.2 and 1.5 percent, when the bond is issued. On top of this, the rating agency is paid its fee by the bond issuer at the time the security is issued. All these fees are earned and paid in full within six to eight months after the mortgage contract is signed by the borrower. the underlying loan. In fact the mortgage broker is paid a larger percentage, termed a “yield spread premium,” if he convinces his clients to accept a higher and more default-prone interest rate. With this structure of incentives, it is not hard to understand why any risky loans were originated, financed, sold, and securitized, especially during the period of rapidly rising house prices from 1999 through 2006. With expectations of rising house prices, it is also not hard to understand why pools of these loans received the imprimatur of a credit rating agency when offered for sale. One does not need to invoke the menace of unscrupulous and imprudent lenders or of equally predatory borrowers to explain the rapid collapse of the mortgage market as house price increases slowed in 2006, before ultimately declining. There were certainly enough unscrupulous lenders and predatory borrowers in the market, but the incentives faced by decent people—mortgagors and mortgagees—made their behavior much less sensitive to the underlying risks. The only actor with a stake in the ultimate performance of the loan was the mortgagee. Everyone else had been paid in full—way before the homeowner had made more than a couple of payments on the loan. The full list of foolishness is maintained at mortgage implode . . . The Economists' Voice: Vol. 5: Iss. 6, Article 2. CEO Clawback Provisions in the Bailout? With Congress recognizing the public's dismay over this massive taxpayer giveaway, we are starting to see some serious questions about the folks who drove the financial ship of state aground. Hence, its time to take a closer look at pay and severance packages for CEOs at investment houses, banks and mortgage lenders, who perversely stand to benefit from the public's largesse. • Goldman Sachs (NYSE:GS)paid its Chairman and CEO Lloyd Blankfein $70 million last year. Co-Chief Operating Officers Gary Cohn and Jon Winkereid were paid $72.5 million and $71 million, respectively. • American International Group (AIG) chief executive Martin Sullivan got a $14 million compensation package in 2007. He was ousted in June. The insurance giant (NYSE:AIG) is on the receiving end of an $85 billion federal bailout. Robert Willumstad was handed $7 million for his three months at the helm. (Edward Liddy took over as AIG’s chief executive earlier this month). • Morgan Stanley (MS) Chairman John Mack earned $1.6 million + stock. Chief Financial Officer Colin Kelleher got a $21 million paycheck in 2007. Morgan Stanley also received an expedited approval to become a banking holding company in 48 hours -- that's record time. • Stanley Neal, who steered Merrill Lynch (NYSE:MER) into financial collapse before being taken over by Bank of America, was given a package of $160 million when he left his post last year; That package makes current CEO John Thain was paid $17 million in salary, bonuses and stock options in 2007 look like a bargain. • Bank of America (NYSE:BAC) is acquiring Merrill. BofA CEO Kenneth Davis brought home $25 million in 2007. • JP Morgan Chase & Co. (JPM) Chairman and CEO James Dimon earned $28 million in 2007. Chase acquired troubled investment house Bear Stearns earlier this year with the federal reserve backstopping $29 billion in Bear assets to help get the deal done. • Fannie Mae (FNM) CEO Daniel Mudd received $11.6 million in 2007. His counterpart at Freddie Mac (FRE) Richard Syron, brought in $18 million. Federal government is taking over the mortgage backers with Herbert Allison to serve as Fannie CEO and David Moffett the new CEO at Freddie. • Wachovia Corp. (WB) Chairman and CEO G. Kennedy Thompson received $21 million in 2007. He was succeeded by Robert Steel as CEO in July. Steel is slated to get a $1 million salary with an opportunity for a $12 million bonus, according to CEO Watch. Wachovia (NYSE:WB) is one of the banks that could be sold in the midst of the financial crisis. • Seattle-based Washington Mutual (WM) will pay its new CEO Alan Fishman a salary and incentive package worth more than $20 million through 2009 for taking the helm of the battered bank, according to the Puget Sound Business Journal. Its time to start talking about a clawback provision as the grounds of any bailout. As I have argued in the past, I have no problem with people making millions or billions IF THEY EARN IT. But these guys above? If every man woman and child in the USA is going to be on the hook for a Wall Street Incompetence Tax of $5-10k each, then the folks who brought us this mess, and took bonuses under the false pretense that the profits they generated were real, should also shoulder some of the costs . . . I just noticed the NYT had a front page article on the same subject, only without any dollar figures as to the salaries and bonuses. Consider the above a NYT sidebar. 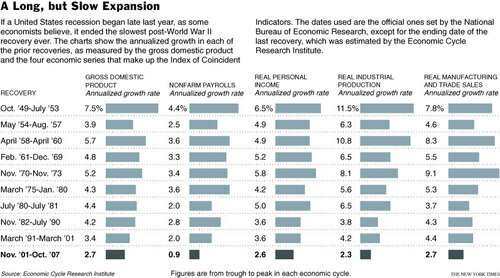 The view of this recovery as an unusually weak one can also be seen in all four economic indicators that make up the index of coincident indicators, a way that the health of the economy is measured. Three of them are adjusted for inflation — industrial production, personal income, and manufacturing and trade sales — while the fourth is the growth in the number of nonagricultural jobs. All of those are measured from the official beginning of a recovery to the official end, which in some cases can be well before a particular indicator turns up. The postrecession trends in employment show particular signs of having changed. Before the recovery that began in 1991, the number of jobs always hit bottom at about the time the recession ended. But it took 14 months after the 1990-’91 recession officially ended for the number of jobs to rise the level when the recession ended. After the 2001 economic low, it took 28 months for the number of jobs to match the end-of-recession total. Today's media pick is from the NYT. For the first time since 2000, the average income actually rose in the US, according to IRS data. I don't think we need to worry about a wage related inflationary spiral, though. "Americans enjoyed higher average income in 2006 for the first time since 2000, when the last economic expansion ended, the latest tax data show. Adjusted gross income reported on tax returns in 2006 averaged $58,029. In 2006 dollars that was an increase of $739, or 1.2 percent, from the $57,289 average in 2000, analysis of Internal Revenue Service data showed. Total income increased by $619.2 billion or 8.3 percent, all of which went to those making more than $75,000, and 42 percent of which went to the roughly one in 400 taxpayers who made more than $1 million in 2006. Average income fell sharply in 2001 and in 2002, when it dropped to $51,870, off nearly 10 percent from 2000, tax data show. 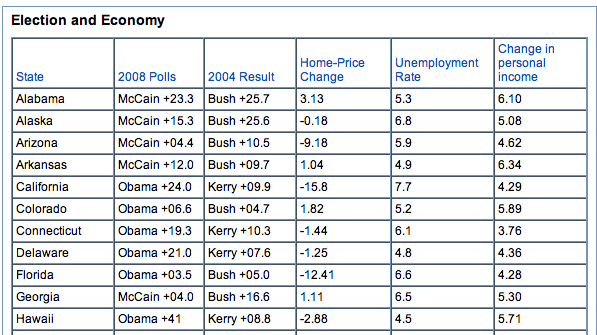 The average grew slightly in 2003. Average income grew significantly in 2004, rising $2,291, and again in 2005, when the average increased by $2,210. Income growth continued in 2006, but at a much slower pace, increasing by $1,369 over the 2005 average once inflation is taken into account. Salaries and wages, by far the largest source of income, nearly returned to the 2000 average in 2006. However, among the highest-paid workers, both total and average wages fell, an indication of how the Internet bubble had concentrated gains among a relatively few workers. The average wage in 2006 was $46,996, down $101, or a fraction of 1 percent, from $47,097 in 2000. Average wages in this decade hit a low of $45,956 in 2003, the I.R.S. data show." Fascinating period of time -- six years of zero wage gains, while goods and services skyrocketed in price. Ouch! 2) It is, a comment pointed out, average, not median -- a longstanding peeve of ours. 3) The IRS measure is rather different than what we see out of BEA or BLS. The Fed's numbers on family income seem to be the most cleareyed. Today's must read MSM piece is a page one NYT article on how second mortgages -- "the borrowing of last resort, to be avoided by all but people in dire financial straits" -- became transformed by a ubiquitous ad campaigns into "universally accepted" forms of credit. Home Equity Frenzy Was a Bank Ad Come True -- part of the NYT's the Debt Trap/Pulitzer bait series -- is a fascinating study in consumerism, advertising and financial ignorance (ads can be seen here). As we noted back in March via, the Federal Reserve released data showing that, thanks to HELOCs and MEW, Household Equity was at all time lows. As the chart below shows, we crossed the 50% household equity level For the first time since World War II. In the 1980s, that figure was 70%. The one thing I haven't really seen explored in this series has been the reasons why the sudden embracing of debt took place. My own view has to do with the aberrant nature of this economic cycle. Instead of being employment and wage gain driven, causing a virtuous cycle of hiring, spending, and capex, and more consumer spending, it was backwards, unusually dependent upon ultra-low interest rates, housing and asset appreciation. Is it any surprise that the weakest post-recession economic recovery since WWII in terms of job creation and wage gains led to an enormous debt creation? People are loathe to give up their standard of living, and they will -- and did -- go deeply into debt to maintain their "lifestyles." More nonsensical tripe foisted upon the world by W. Michael Cox and Richard Alm again. For those of you who may not recall, they are the senior vice president/chief economist, and the senior economics writer at the Federal Reserve Bank of Dallas. These two have started a cottage industry dedicated to proving how great things are economically. This is now the third attempt at this sort of intellectual dishonesty, and if I didn't know better, I would suggest that they have a political agenda. Of course, that's impossible for any Federal Reserve Bank, even one in Texas. Rather than spill too many pixels on the likes of these two, I will instead direct you back to the last time these two characters pulled similar shenaningans. You may recall back in February they attempted to show how little income disparity there was in the US through the use of misleading quintile data. I called their deceptive fraud for what it was in Hackonomics. Their latest junk economics is in The American Magazine, titled How Are We Doing? The duo repeat their consumption arguments, hoping that the third time will be the charm. Perhaps repetition might succeed where reasoning and logic failed. Amongst the various bensteinery in their rhetorical arsenal, my favorite is the temporal arguments they seem to favor. We addressed this sort of economic silliness back in 2004's What is Wealth?. Here are a few colorful pieces of silliness form the article. Congratulations! You've rediscovered the Technology Adoption Lifecycle and production quantities of scale! 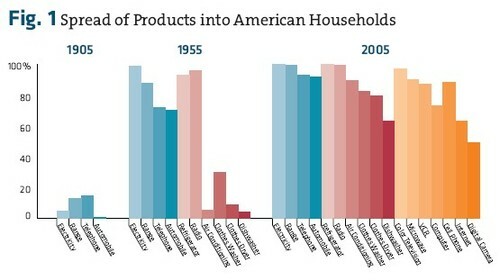 For more on this, see #3 Comparing Household Consumption. Nearly 100 years later, we are more efficient and productive. Go figure. I will be fishing with one of their Dallas Fed coworkers later this month, and I will be sure to ask what the real deal with these guys are. Exactly one year ago, my pal James Altucher penned a Real Money article, The Underlevered American Household. I found it perplexing -- I didn't see why anyone would want to lever up more in the fiscal environment we were looking into. My response was a Real Money (sub only) column titled Ignore Statistical Oddities at Your Peril. But I also found his column instructive in that it forced me to more carefully articulate some ideas I had been kicking around for a while. 1) Always pay attention to statistical anomalies: They are invariably informative. If for no other reason, they make you think about how we gather and use data. In the "under-levered case," I had to consider different time frames, chew over context. I thought it was important that the savings rate went negative for the first time in three quarters of a century. That oddity got my attention -- and for good reason. Since then, the economy has likely slipped into a recession, and the Dow has fallen 12%. 2) All book keeping is double entry: James reminded me that for every purchase, there is an opposite asset acquired. Its easy to occasionally forget that. However, just because each side of a ledger entry is quantitatively "balanced" does not mean they are qualitatively "equal." That's important to remember, because . . .
Its another lesson too quickly forgotten from the 2000 crash: Always distinguish how debt and assets behave in differing economic conditions. 4) Spending habits change as the economy cycles: The savings rate reflected that. People continued to spend not their wages & income, but their assets, in order to maintain a lifestyle and/or a standard of living. Note that this is more than just miles driven or which cars get purchased due to high oil. Our entire mind set shifts as the cycle turns from expansion to plateau to contraction to bottom. 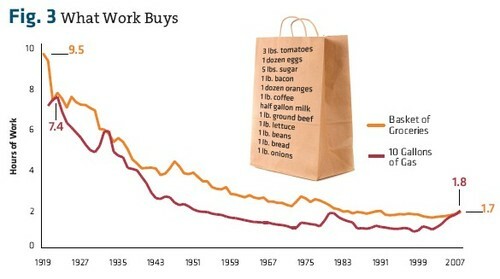 People cut back, spend less, hunker down. While that eventually leads to pent up demand, lifting the expansion when it rolls around next, its a process that takes a few years to play out. 5) Real, inflation-adjusted income matters: Despite real income being negative, as a nation, we took a long time to adjust our consumption habits. Consuming more than earnings has significant repercussions. Instead of seeing wage gains being used to raise living standards, we consumed Household equity as if it were actual income. There is an enormous difference between borrow and spend, versus earn and spend. Which is precisely what the negative savings rate was warning those how were paying closer attention . . .